In response to this savage destruction must arise a savage resistance. The nascent Parisian movement Nuit Debout, or ‘Arise at Night’, is an eligible contender. Since its humble beginnings in March 2016, it has gathered momentum, curiosity and support within the Place de la Republique in Paris. Originally protesting labour law reforms, the movement has broadened its agenda to express revulsion for the kind of ‘savage, destructive nihilism’ Badiou spoke about. 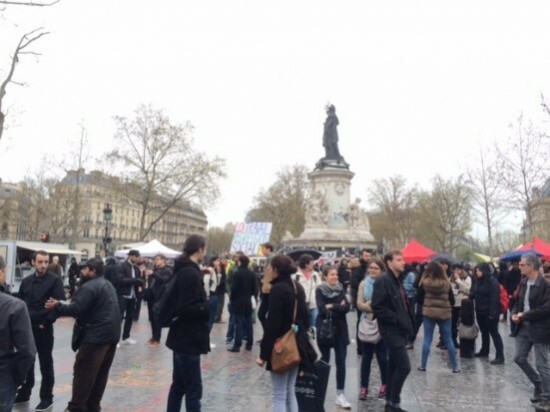 On an overcast April evening, I wandered into the Place de la Republique to join disaffected youth, students, workers, and everyday Parisians involved in the Nuit Debout. Amongst pamphlet stalls, street food, and a veritable mix of drinkers, dancers, and onlookers, a large group sat listening attentively to a public speech. To intermittent applause, grievances were made about Francois Hollande, Brussels, Google, and ISIS. A number of people patiently awaited their turn at the microphone. ‘Take our business,’ was one cynical catchcry. ‘Better pay and conditions for psychiatrists,’ said another. Banners nearby also proclaimed ‘Loi travail = regression sociale’, or ‘labour laws = social regression’ in reference to the origins of the movement. The atmosphere was uplifting. The indignation of the gathered crowd was palpable, and the frustration with their political leadership unanimous. As an outsider, their self-expression was refreshing. Liberal capitalism is an oxymoron; it is not liberal and never has been. This is not lost on the crowd gathered beneath the foremost symbol of French liberty – the statue of Marianne. Liberal capitalism is an expired philosophy, lacking moral or ethical weight or any sense of the greater human ‘good’. It serves self-interest to the exclusion of all others. It is propounded by servile governments and protected by a vast corporate monolith. Pope Francis reflected upon this in his 2015 encyclical: ‘we need to reject a magical conception of the market, which would suggest that problems can be solved simply by an increase in the profits of companies or individuals.’ In Greece, the population rejected the philosophy of liberal capitalism in their July 2015 referendum. Their maverick finance minister Yanis Varoufakis spoke about overcoming ‘the triumph of the shopping mall’. The Nuit Deboutistes now declare the same. In the spirit of the famed soixante-huitards, Nuit Debout is making itself known without any appointed leader, organisation, or hierarchy. It works in a participatory way, giving a microphone to anyone’s grievance with the world. It has also spread from Paris to other parts of France, and spooked a fragile Hollande government. A popular will has emerged to voice its disgust with a familiar Western reality; the pitiful neoliberal status quo, and the consequences of that on society. This includes the impermanency of modern work, the debt enslavement of the working and lower-middle classes, and the dominance of multinational conglomerates. Those oppressed by these powers are finding a voice, and it is echoing worldwide. 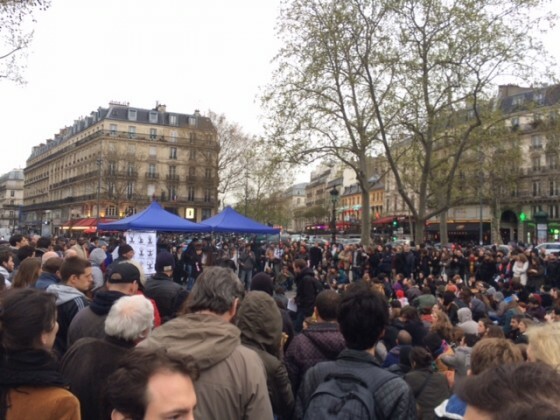 Nuit Debout represents a mood for change, both in the short term for domestic French politics, and in the longer term context of Western democratic society. The destructive nihilism Badiou referred to has begun to destroy the fabric of society – community itself – in favour of the individual. But there now exists a ‘destructive’ resistance. 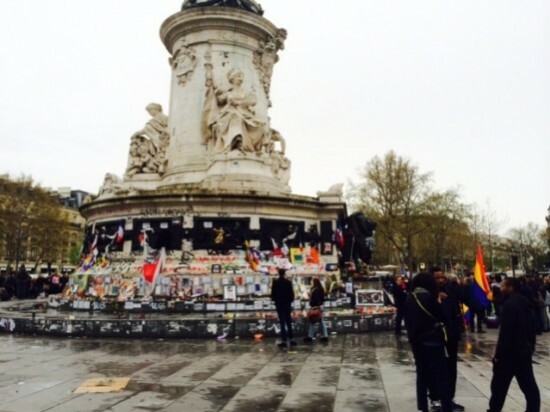 As reports in late April show, the Nuit Deboutistes have been clashing violently with police. Unsurprisingly, the protests do not look like losing steam. France has a reputation for social progress. From the Enlightenment onward, philosophical, intellectual and political revolutions from France have influenced the course of history. From the overthrow of the ancien regime to May 1968 and everything in between, the French have questioned authority. French thinkers have reflected on and provided inspiration for this tradition, in the thoughts of people like Rousseau, Foucault, Camus and Sartre. Ideologies were written, revolutions born. Protest has shaped modern French identity, and been integral to its development. As the late Christopher Hitchens said, in relation to 1968: ‘the anti-totalitarian ethos embraced by the best soixante-huitards remains an option, and I believe that it will have further opportunities to declare itself.’ This ethos is declaring itself again, in the Place de la Republique, Toulouse, Rennes, and elsewhere in twenty-first century France. A movement like Nuit Debout is vital for democracies everywhere. Protest is central to the popular sovereignty that validates democratic government. Democracy requires fierce debate and a conflict of ideas. The prevailing ideas of post-Cold War Europe have become stale, and a new dawn approaches those like the Nuit Deboutistes. This could include Australia, where a real political will is lacking to voice protest. Previous protest movements, like Occupy in 2011, were quietened by an unsympathetic community. Recent state laws, like those in New South Wales, have attempted to destroy this fundamental civil right. Sadly, criticism of the economic status quo remains on the fringes of political discourse in Australia, and protest, in any form, remains a measure of last resort. Australian progressives have taken inspiration from international movements before to voice their opposition, like during the Vietnam War moratorium marches. History, in this case, should repeat itself. If large democratic movements like Nuit Debout make international waves, Australia can follow, given the right circumstances. Like in Spain with Podemos and the Syriza coalition in Greece, disparate protests can morph into electable parties. Electable parties can challenge the status quo, and present change. But it all begins with protest. Patrick Hannan is a law student, freelance writer, and recent intern at the International Bar Association's Human Rights Institute in London. He is from Melbourne, Australia. It’s great. Patrick inspires me and I am a third year law student !